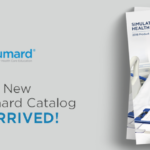 The Hal® 3201 manikin sets a global standard for medical human patient simulation. Tetherless simulator technology allows the communications, compressor, and power supply to be inside HAL®, eliminating external tubes, wires, and compressors. HAL® operates continuously during transport and training can occur in the working environment. Rush HAL® from the accident scene to the ER, to the ICU, while care providers diagnose and treat his condition using real monitoring and resuscitation equipment. Control HAL® at distances up to 300 meters and between rooms and floors of conventional buildings. HAL® smoothly transitions between physiologic states in response to commands from a wireless PC.